And, truthfully, if you judge my year based on the posts live on the blog right now it looks bad. But reality is that you're missing a few dozen from January to June. I serially published a book here at the beginning of the year but had to take those posts down to make the book part of the Kindle Unlimited program. I'm a very, very small fish in Amazon's very, very big pond, but I didn't want to get sideways with the 800-pound gorilla of the book publishing industry. That book, by the way, Rubble and Ruin: Welcome to the End, is by far my most successful publication to date. It's sold about 150 copies so far, and it's been read by about as many Kindle Unlimited readers. I've made twice as much from that one book as I've made from everything else. Rubble and Ruin was my only book published in 2017, but it was one of three books written this year. I've also written the follow-up, the next part of Mac and Caroline's story. It's been edited, I just need to take another pass through it and it should be ready for publication in January. There's also a book, the first in a series, about the crew of a space station that's edited and ready to go. And I'm about 10,000 words into a space adventure story about a group of freelance pirates and their semi-sentient ship. It's a fun story so far. I think you'll like it. Both of these should publish in the first part of 2018. I have a plan for next year, but I'll write more about that in another post. On a personal note, our family of four became a family of five this year. And I became a little less outnumbered. We welcomed a son, Liam, to the family in mid-November. He's amazing so far, but I think all of my kids are. His sisters love him more than I thought they could. They are great with him. Mom is ecstatic. So is dad. Gina and I had always talked about having three kids, but actually having a third was something we wrestled with. We have two absolutely perfect girls. Were we pushing our luck trying to have one more? We decided that we didn't care. We've always seen our version of the Rush family as a party of five, and we trusted God. So we went for it, and I'm glad we did. Liam feels like he was the last piece of our puzzle. We're complete now. Because life wasn't chaotic enough with the holidays and a new baby, I left my job of almost four years and started a new one the week before Christmas. It's an amazing opportunity to combine everything I've done in my career so far into one job. I won't bore you with too many details, but I'm essentially getting to start a trade publication for a sector of the healthcare industry. I'm having to pull on some rusty journalism levers, and that's fun to do again. But I'm also taking some of the marketing tricks and tactics I've learned over the last six years to both bring readers and to build email lists that we can then eventually monetize. It's still very new, but it's also a lot of fun. I'm getting to envision what this publication actually looks like and how it operates. So, all of those things that I've suggested clients try over the last few years I can actually put into place. So I'll either prove myself a genius or a fool. I think that's it. I've been gone a while from here, but I think I've got you all caught up now. Quickly, if you were one of the people who bought Rubble and Ruin, thanks. That book has been a fun ride so far. And like I mentioned briefly above, I've got some plans for 2018. Plans that I think are doable assuming life doesn't throw me some unexpected curve balls. I'll share those later this week or early next. Until then, have a blessed end to 2017 and a wonderful start to 2018. 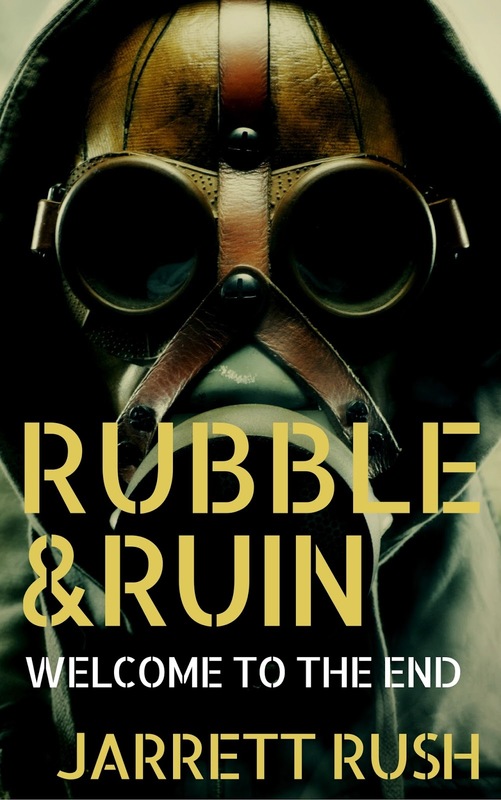 Rubble and Ruin:Welcome to the End is live now! ebook was live the week after the final installment went up. And, today, that's what I'm able to do. It took a lot of work during a busy week at the day job, but the book is live. At Amazon at least. I've still got some work to do to get it ready for the other retailers, but Amazon is the giant. It was a priority to get it listed there. In the middle of the night last night that happened. So, like I've been mentioning as we were publishing the individual installments, if you enjoyed the story I'd appreciate you picking up a copy. It won't cost you much, at least through the weekend. It's launching at 99 cents so those of you here can get it cheap. After that the price goes up to $2.99. Get it here now for less than a buck. Thanks for sticking with us for about seven or eight months, however long it took us to get the 33 parts posted. It's been a fun experiment for me. Hopefully, you'll keep coming back to the blog. I'm going to drink the marketing Kool Aid that I sell to clients, and start posting here more often. We may even do another serial story. It's a new year. Time for new goals. I've done these posts in the past and they've always been very specific. I'll write this. I'll finish that. Very ambitious. Very foolhardy. Not this year. This year I'm resolving to have a new attitude. It comes from two things. The first, I was watching The Wall the other night. It was on. I was ironing. Quick setup for the game. You answer questions. If you get them right you drop a ball down a Plinko-style board. There are slots at the bottom of the board that represent dollar amounts. Wherever the ball lands, you win that amount. Get the question wrong, drop the ball and lose whatever amount it lands in. The contestant I was watching at the time had earned $1.34 million in winnings so far. He gets to the last question. He decides to drop three balls on the next question. get it right and he could add $3 million to his total. Get it wrong and he loses, but what are the chances of losing it all? Slim, right? You can likely see where this is going. He gets it wrong. He drops three balls. They land in $1 million; $300,000; and $50,000. Total: $1.35 million. There's more to the game, and he still had a chance to win $100,000 or something, but I had to attend to something else. I don't know if he walked away a winner. But, seeing him lose all of the money, literally a million dollars, on one question was heartbreaking. I laughed that awkward laugh that comes out when you don't really know how to react to something. I felt awful for him. But then the next day or so, I thought about him more. And what I thought was "Good for him." No, he didn't win the big money. But he didn't lose it either. It was never his. It was just numbers on a screen. But that attitude, the one that says "Go for it," is one that I admire. And it's one that I want to adopt for my writing life in 2017. It's one I should also adopt in the non-writing part of my life too. This attitude shift came from not just seeing the show, but something else helped cement the idea for me. I am reading through the Book of Luke every morning. The other day I got to the verses where Jesus feeds the 5,000, and something kind of clicked for me. It wasn't just in my writing life either, but throughout everything. God can take whatever we have, no matter how small, and make it great. He takes a few loaves and a few fish and feeds thousands. If he can do that then he can take what I have, no matter what it is, and turn it into something. So, if that's the case, then why am I holding back in my writing life? Why am I not being like the guy on the game show and just going for it? Why am I not writing more and publishing more? Why am I not giving my writing and my ideas around publishing to God and just going for it. Trusting that he can take whatever I give him and make something with it. So, for 2017, that's what I'm going to do. I'm going to go for it, and trust that if I bring God something—anything—he'll be able to make something with it. There you go. Publicly stated goals. Can't take them back now. Took a bit of a break from the serial story over new years, but that'll be back Friday. And if you need to catch up, you can do that here. Until then, see you soon.